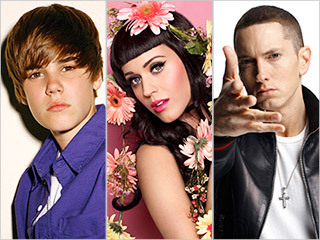 Rapper Eminem and country group Lady Antebellum led the American Music Awards nominations with five nods each. The nominees were announced Tuesday. For the fourth year, winners will be determined by online voting at the official Coca-Cola voting location www.amavote.com as well as ama.abc.com. Artists will be honored in the categories of Pop/Rock, Country, Rap/Hip-Hop, Soul/R&B, Alternative, Adult Contemporary, Latin, Soundtracks and Contemporary Inspirational. The show is set to air live from L.A. on Sunday, November 21st, and has announced Usher, Pink, and Bon Jovi as preliminary performers.